Yes! 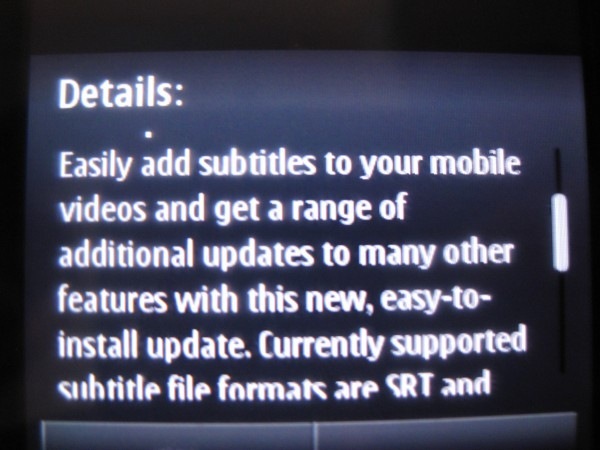 you are watching a video with subtitle on Nokia N8 itself. 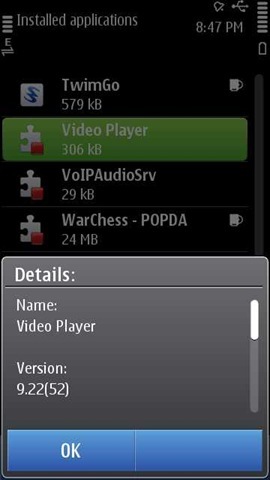 Nokia N8 just getting better and better, making sure that you wont miss your video player ever again. Dolby sound, HDMI out, multiple codec like Divx support out of the box, flawless performance, USB OTG .. what else you expect from your video player? 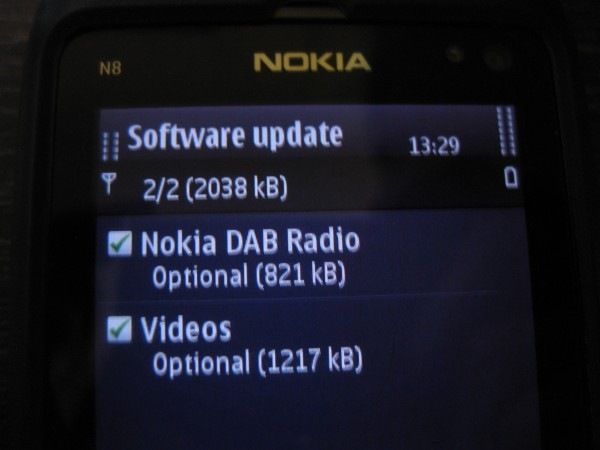 As reported by MyNokiaBlog, all Symbian^3 devices received two software updates by today evening. Though at least my Nokia N8 didn’t received any of them in normal way, but by changing the dates to a forward date, I got the Videos update at least (which was of main importance to me). Thanks @Harkison for the tip. With the new player, I am not only feeling a boost in performance, but also an increase in the volume as well. I loved Nokia N8 for its video player and its support to most of the available formats even if I mentioned once that UI seems limited in some senses. It’s so good about loading videos of high size and even much higher bit rates (I have a 5mbps one) and I rarely faced any lags if I tried to forward any video to literally any position. A genuine Multimedia monster Nokia N8 been since its arrival. 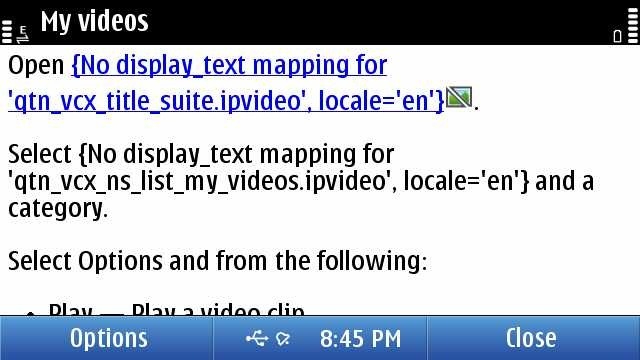 I remember that day when I asked Steve @AAS about subtitle support in Symbian^3 video player and he replied that it would be asking a little too much at the moment. And today, it shows that Nokia been listening us. The new version of video player is not only the faster one, but supports subtitle support too with most common subtitle formats .srt and .sub. Subtitles are textual versions of the dialog in films and television programs, usually displayed at the bottom of the screen. You just need to have a subtitle file with same name as the video file (extension as .srt or .sub) in the same folder and when you play the video, most of the players will pick the subtitles and will show the text version of dialogues along with the videos. In most of the cases, you can find the subtitles for movies from the popular sources like subscene.com etc. Desktop players even support adding subtitle support via simple drag and drop but due to minimalistic UI approach in Symbian^3 video player, it wont be a possibility here very soon and you have to make sure that both the video and subtitle share a common name. Update: It seems that advancing date trick not working for people neither I am able to get proper help files for videos application as of now. It looks like the videos application is about to come bundled with few other things as well. Check the screenshot of Help files …. You can read about DAB on this wiki link and it says that Digital Audio Broadcasting (DAB), is a digital radio technology for broadcasting radio stations, used in several countries, particularly in Europe. As of 2006, approximately 1,000 stations worldwide broadcast in the DAB format.The well known name BBC launched the first DAB digital radio in 1995. While it doesn’t seem applicable to Indian continent, even Ovi Store link doesn’t work, I am also wondering that if its DAB or DAB+, because DAB been under criticism for performance reasons and weak reception even in good areas and knowing Nokia, I could say that they wouldn’t push something that might been criticized for reception at least. Yet to obtain more details on it as I have not received this update yet. Finger crossed that they are delivering a DAB+ product here. What annoyed me more about this DAB update is it requires some kind of special hardware decoder and I thought I only hate the requirement of plugging in headset for hearing radio. Anyway ..
Update: Thanks for our prompt reader Ole to bring the info that this is actually equipped with the latest tech that will be DAB+. 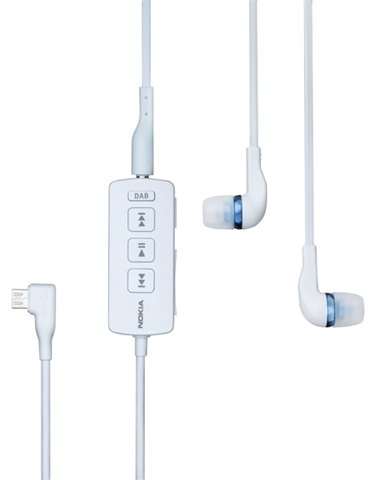 Check the news around the special headphones required for this tech here. So, what you think.. is Nokia right on tracks to deliver fast updates to their leading platform, like they really need? Is touch to focus might be among the upcoming updates being a highly requested feature like portrait QWERTY? Seems possible now, isn’t? DAB is not available in India… so don’t need the update…. but video player wid subs…. awesome… the update has not yet come to my phone…. do u thing extending the date does the trick n no side-effects???? if extending date works for updates… then y not we get PR1.1 same way??? that means PR1.1 is still not on server anywhere…. mate think of a person like me who used to watch movies almost daily and have a collection of 2.5Tb movies. This is a huge plus for me. PR1.1 is not over servers as of now as being tested and improved, so obviously not available. i tried buddy..still no luck. Is it due to heavy traffic on the nokia server? Might be. Many reporting that they are not able to get it working any more. Hey after installing video updates..now not a single video working..i Cannot see the video .audio is working fine. Hey wht could have caused this? Hi Nitish, I am posting from Kuwait. I just got this so called video update. However, yet to try with video+sub title. You always wrte great news bro…. Its really great to read them…. Pingback: First Look: The Nokia C7-00 and a review. - Jane Talks Tech! Pingback: First Look: The Nokia C7-00 and a review. | | Jane Talks Tech!Jane Talks Tech! 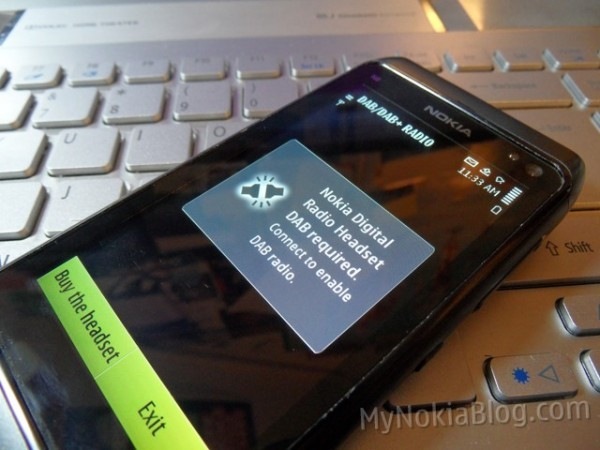 Next Next post: Is this Nokia E6-00?